There’s a new meetup for all you sketchers out there :: Scribble Picnic :: hosted by Michael MacVean. 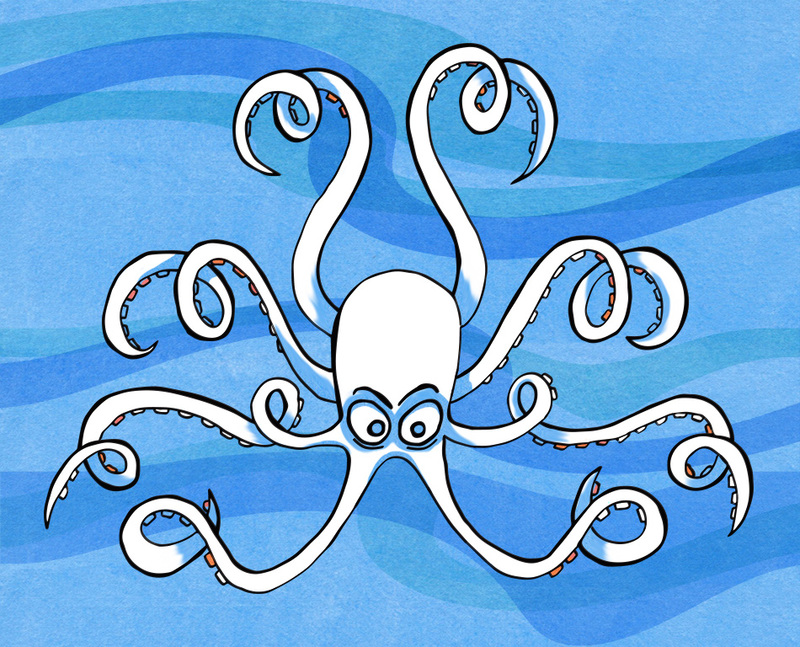 This week’s theme is Octopus. I had a little trouble concentrating on this one. To me, an octopus looks very like a spider. Which I absolutely hate!!! They are just too creepy. Octopus are just larger, underwater spiders in my opinion! Please hop over and take a look at other illustrator’s interpretations of the theme. He does look a little scary, but I think deep down he is just putting on a show and is quite timid. He is kind a cute though! Great drawing Sue. Hahaha, well, Sue, yours doesn't look too scaryand is super well rendered. I LOVE the colours you chose for it and the overall style. Thank you for overcoming your thoughts on octopus to join in. Yes, not my fave creature in real life but I love to draw them kid lit art like...with mouths where they don;t belong -above the legs! More friendly that way! yes, now that I think about it, an octopus is like a spider, though I do not encounters them often so... your octopus looks a bit angry, maybe, I like the color details around his arms/legs. good take on the theme. I totally had that spider thought when I was drawing mine. I love yours, simple, but expressive and illustrative. I love the blue and white contrast. This is very nice Sue, love the blue water too. He does look a bit scary lol. So cool! I love your take on this week's theme. I agree with Linda, I think the octopus is just putting on a show - not actually mean! Love the bright colors you used. Ooooooh, he has a dastardly plan! You can tell that you don't like octopuses - what a face! But the picture is great. Love the background. I love the blue background on this. It really highlights your octopus so well. hahaha I've never quite thought of octopus' as spiders but you're right. Most of the photos I looked up online to reference left me feeling creeped out, too. But hey, you did a wonderful job and captured the expression perfectly. Perhaps he's just a bit grumpy and tired from having to keep track of all those tentacles. Love the water! 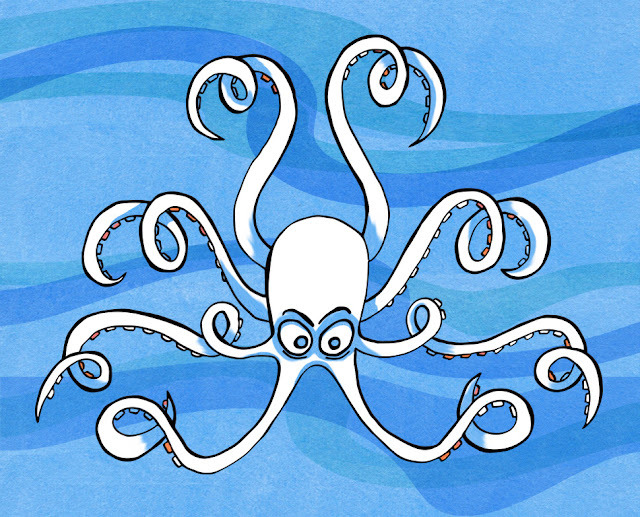 It's great how you captured the typical attributes of the octopus. Wonderful illustration!